My sister found this recipe here. I really wanted to make a cheesecake/apple pie. This seemed to fit perfectly for what I was looking for. It was really good. My dad loved it! Making cheesecake in a bar form was so nice to cut and serve up. It was also easier than baking mini cheesecakes. These were easy to make. I managed to bake them on Christmas day even with all of my holiday cooking going on. Preheat the oven to350 degrees. In a medium bowl combine the flour and brown sugar. Using your hands, a pastry blender, or two forks cut in the butter until the mixture is crumbly. Grease a 9x13 pan. Press the mixture into the pan. Bake the crust for 15 minutes or until it is lightly browned. In a large bowl beat the cream cheese with the sugar until it is smooth. Next mix in the eggs one at a time and then the vanilla. Then mix together the chopped apple, sugar, cinnamon, and nutmeg. Pour it over the cream cheese mixture. Next mix together the brown sugar, flour, oats, and the butter until it is evenly mixed together. Bake the bars for 40-50 minutes, or until the filling is set. Allow the bars to cool before drizzling with caramel. 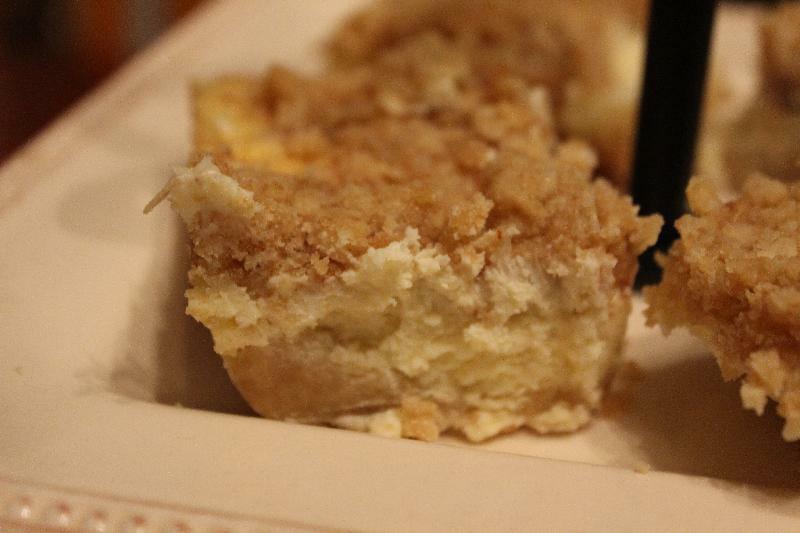 Description: A delicious combination of apple pie and cheesecake in an easy to eat bar!